This circular walk starts from the market town of Richmond and passes close by to Richmond Castle before dropping down on to the River Swale. The river is followed to Easby Abbey, which was founded in 1152, whose inhabitants, canons rather than monks, were known as the white monks. A disused railway is then followed back to town, which affords wonderful views of the castle perched up high. Parking: In the market square in Richmond. There are also many pay and display car parks close by in Richmond (grid reference NZ 171 008). The walk starts at the Obelisk in the Market Place. The obelisk, built in 1771, marked the location of Richmond's water supply. Walk downhill past the Holy Trinity Church to the right hand bottom corner of the square, and turn right along Millgate. This winds steeply down to a small car park by the river below, with Richmond Castle up to the right. Enter the car park and take the riverside path from the far corner of it heading back around to the left, stopping to admire the waterfall created partly by the weir just above it. Pass immediately through a concreted picnic area and continue heading downstream on the riverside path. As the bridge approaches ahead, head to the left hand side of the grassy area and on to the tarmac path which leads out on to the road which crosses the bridge. As the road is reached, go straight across down a lane (Lombards Wynd) to the right of the church, then turn almost immediately right down the lane, which initially heads down hill, then rises, and after a few yards there is a green sign for "Easby Abbey ¾ mile". The track soon becomes unmetalled and begins to climb slowly, affording excellent views back through the trees to the castle behind and to the right. At the drummer boy plaque the track splits. According to legend the stone marks the spot where the Richmond drummer boy reached in the tunnel supposed to lead from Richmond market place to Easby Abbey. The plaque marks the spot where the sound of the drumming ceased and was never heard again. Ignore the tracks ahead and take the right hand path to the right track stating "private property", and head along the right hand side of the fence a few yards to the left of the River Swale. Follow this path for just under half a mile where the path leaves the riverbank by way of some steps leading upwards to meet another path. Turn right along this path and after a few yards pass through a kissing gate into a field. Here the path splits, take the right hand fork keeping close to the wire fence and head for Abbey Mill ahead. Upon reaching the mill, where the fence meets the wall in the corner of the field, pass through the kissing gate, then through a metal gate and continue ahead down the conifer lined track. A little further down this track there is Easby Abbey on the left hand side. The Abbey of Saint Agatha Easby was founded in 1152 by Roald, constable of Richmond Castle. 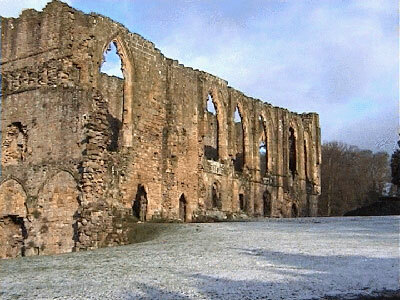 Easby is the house of the Premonstratensian order founded by St Norbert of Premontre, Laon, France in 1120. The inhabitants were canons rather than monks and were known as the white monks. They undertook preaching and pastoral work in the region, but followed a code of austerity similar to that of the Cistercian monks. Other Premonstratensian houses included Eccleston (County Durham) and Shap (Cumbria). Next to the Abbey is the parish church of Saint Agatha, Easby. The road here can be followed around to the left to pass the ruins of the original church built in 700AD, and on for a further one hundred yards to obtain a view of the Abbey in the foreground with Richmond Castle on the horizon. Return back down past the church ruins and down the left hand side of a small car park to continue along the riverside path following the public bridleway sign. Continue along the gravelled track for a further five hundred yards to where the path splits. Take the higher left hand path, and follow the path around and over the bridge to the right. The path now enters out on to the line of a disused railway. This was part of the old Darlington to Richmond railway line. Follow this disused railway line for about a mile, at one point crossing a road to continue ahead, until the path passes out in to a large grassy picnic area just short of the old railway station. This station now has been converted into a fitness centre and a swimming pool. As the track ends, continue along the paved area down under a small bridge which limits traffic to nine feet in height. As the swimming pool car park is entered, turn right down some steps and follow the path down the side of the swimming pool itself. As the path reaches the river, turn left and follow the path along and down through two kissing gates under the bridge over the river. After passing under the bridge, the path veers off slightly left and up hill, and pulls in along side a fence. After a hundred yards pass through a further kissing gate and continue straight ahead, ignoring any paths that branch off to the right heading down in to the woods below. Keep ahead and pass through a further kissing gate now heading slightly up hill to the left of the trees surrounding the riverbank. About fifty yards further on, the path passes through another kissing gate and enters in to the woods following a yellow waymark arrow pointing downwards. Head down along the man made steps through the woods, pulling in close by the river just upstream of the waterfall. Continue along the riverside path. Up to the right there are excellent views up to the Castle perched high up on the rocks seemingly impenetrable. The path then passes out in to a field, which is Richmond Town Football Club. Keep to the right hand side of the field and head to the right of the changing rooms ahead and out on to the road. Turn right on to the road and right again over the bridge. About thirty yards over the bridge as the road bends around to the left, turn right up Bridge Street. As the road bends around to the left, turn right through the no entry signs in to Cornforth Hill. Head up this steep cobbled street and pass through a surviving section of the medieval wall around Richmond. Continue on up the cobbled path around to the left, then turn right and follow the road around in to the market place.